House and time at Malvern: No 7, 1897 - 1899. Died: 30 September 1914 aged 32 in United Kingdom. Died of wounds received on the Aisne. Son of R. Mason, West Mount, Edgbaston. b. 1882. 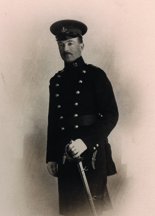 In business; 2nd Lieutenant Warwickshire R.A. (V.); retired. 2nd Lieutenant 3rd Batt. N. Lancashire Regt. 1911. Great War, mobilised 1914. Died at Netley, September 30, 1914, of wounds received at the battle of the Aisne. 'He was much attached to his old School, which he visited as often as he could. At school he was a keen member of the Artillery Corps, and on leaving to join his father's business he took a commission in the Warwickshire Artillery Volunteers. In that Corps he became a most keen and efficient officer, and finally gave up business and joined the Special Reserve, as it was his ambition to join the Regular Army. He belonged to the Loyal North Lancashire Regt., and with it went abroad with the first division of the British Expeditionary Force. He was at the Battle of Mons, and was subsequently wounded on September 14th at the Aisne, and brought home to Netley, where he died. It was found that the force of the German bullet had driven the metallic identity disc into his lungs.' (Malvernian, Nov 1914).